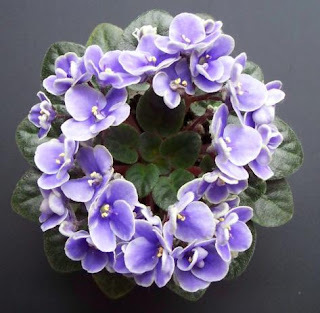 Violet Obsession: Time for Pictures! Glitterstar (I. Fredette) Bright pink/ruby sparkle edge. Variegated dark green, ivory and rose, plain. Standard. Glitterstar was given to me by a friend in Missouri and she got it from her mom. I was playing with some lighting effects. 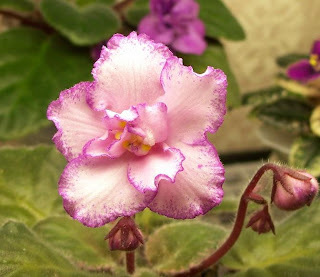 Below is the same plant under my plant lights, a few days earlier when only one bloom was open. Curlina (A. E. Adams) Single rose pink, faint geneva. Variegated TL. Miniature. I love this little plant. I wish I knew what year Curlina was introduced. Windsome (10116) 08/15/2009 (H. Pittman) Semidouble medium blue/white edge. Medium green, plain. Miniature (DAVS 1508, TX Hyb). Windsome is another cute little plant. I won best in class with this one in a show a few years ago. It has been around for quite awhile, but I see there is a registration date now, so it must have been registered last year. Now I can't recall when it was introduced. 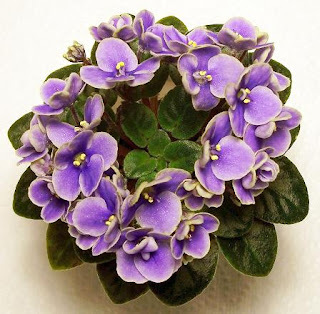 I wish the AVSA would preserve the introduction date when an old violet is registered. The picture above in indoor lighting and below is window light. There is a story behind this picture. I grow minis. They like me. Standards tend to stay small-ish for me, more like large semi-minis. Usually by the time they are approaching standard-size the outer leaves are dying. I don't have a lot of luck potting up, either, but I received a couple 5-inch pan pots (really shallow pots for planting bulbs). So I potted Topps in a pan pot. It is wick watered, but it often runs dry. 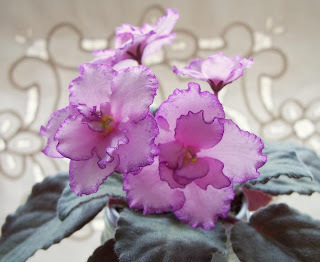 It sits on a high shelf in a south window, sheltered from full sun by a lace curtain. None of my home-made light shelves are wide enough. Anyway, the last time I took it down for watering I thought "holy cow this plant is getting big!" So I took a picture with a 12-inch ruler. The plant actually measures nearly 16 inches across. I know people who regularly grow violets this size and larger but this is a first for me. 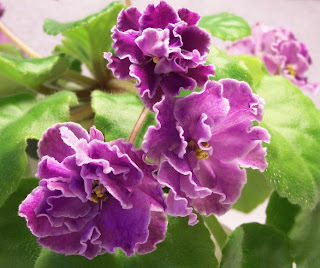 your violet photos are great! 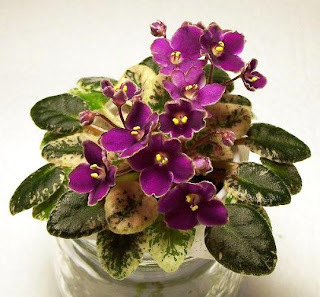 I used to have some violets by Richters- they were pretty. Thanks! I wish you still had the Richter's. They are so hard to find. Candy - your Windsome looks like a Best In SHOW to me. Disbud it and get it ready for the Illinois State Show - I think you should enter this year!!! Sorry it took me so long to find your comment A:-). 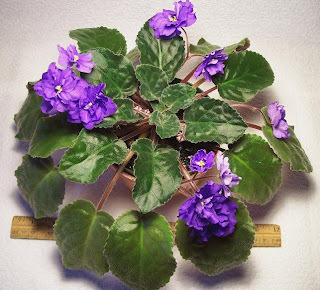 This is the same plant I won BIC with at our club's show a few years ago. I miss that, I really do. I don't know when the Illinois State Show is or was but Windsome doesn't have a single bud right now.